Let us help make your garage door safer! Making sure your garage door is able to continue functioning optimally for a long time is a great way to save money. By having it routinely inspected and cared for, you will be able to extend its lifespan and to avoid a lot of costly repairs. Our company has a special maintenance service that we can offer you, which will accomplish all of this and then some. We're not saying that you need to have your garage door checked every single day or every month for that matter. The frequency of maintenance must be actually based on the needs of your system, as the weight of your door, as well as various other outside influences, will affect this. Clearly, brand new systems don't need to be serviced as often as older ones do. Our technicians start by inspecting every part of your garage door thoroughly. From the interior tracks to the exterior side of the panels, nothing will escape our examining eye. If we find any component that's looking a little too worse for wear, we'll replace it on the spot. We also check to make sure that everything is well fastened and secured in place. Once we're done, well begin perform spring and cable adjustment, as well as lubrication of the rollers and the hinges. This will keep rust and corrosion at bay and will make sure all of these metal components are able to work smoothly and efficiently. When it comes to your opener, there are a lot of tasks that we will do to make sure it is in an optimal condition. We'll inspect its interior logic board to make sure all the electrical wires are in good shape and that none have become detached. We'll also test its different features to see if they are able to function the way they're supposed to. Last, but certainly not least, we'll test the photo-electric eyes. 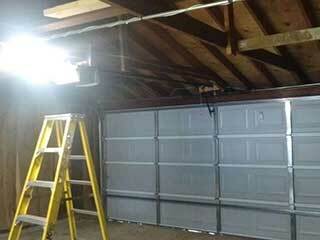 Garage door opener sensors maintenance is one of the main focuses of our service. We'll check the alignment of these components to make sure they are able to properly detect an obstacle. If something is wrong, we'll realign their position on the spot. Preventative maintenance and consistent adjustments will keep your garage door working like it did the day you had it installed. That's the main goal of our service. Although some garage door parts do not need regular inspections, when we always make sure to check them thoroughly just in case. Keep in mind that if you, for example, have an old steel door, you will need to keep it rust free by looking over the door periodically and removing any rust and painting residues. A wood door might need repainting as well, depending on the climate of your local area. Heavy winters, dry climates and moisture will affect the condition of the door. We also take care of dents and small problems in order to keep it strong and resistant. Contact our team at Garage Door Repair Rocklin to schedule an appointment today.